Headlies: Rusev Replaces Rouseff As President Of Brazil - WrestleCrap - The Very Worst of Pro Wrestling! Brasilia, Brazil – In an incredible turn of events that will have repercussions throughout the world, the people of Brazil have chosen WWE Superstar Rusev to replace their current president Dilma Rousseff. Rousseff’s ousting, after once boasting an 80% approval rating, came after impeachment hearings due to economic woes and government corruption. 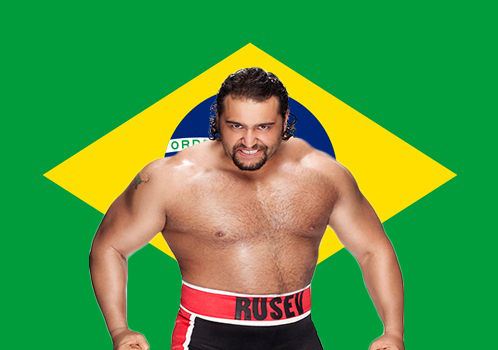 Brazil’s future was thrown into uncertainty after the news until Rusev decided to step in. Rusev’s unexpected rise to power came after he and his manager/fiance Lana road through the streets of Sao Paolo on the same tank he used at Wrestlemania 31. Rusev then put several corrupt elected officials The Accolade submission hold until they confessed their crimes. After his actions appeared on international television, Rusev was quickly voted into office after an emergency election was called. Currently, Rusev’s approval rating is at whopping 96% while Lana’s is at an unfathomable 154%. In Rusev’s first week in office, Brazil’s economy has vastly improved, trade is up, crime is down, and things look to improve further after his first Presidential address. Chants of “Rusev!” rang through the Brazilian air at the promise of the new President destroying WWE Superstar John Cena and making him drink the sewage-filled water of the Rio de Janeiro. 4 Responses to "Headlies: Rusev Replaces Rouseff As President Of Brazil"
Meanwhile back at The Hall of Doom the reunited League of Nations held a evil meeting to discuss evil plans of being evil. However at The Hall of Justice, John Cena and Gleek spy on the nefarious evil doers and hatch a plan to stop their evilish evil ways once and for all. Spoiler Alert: Cena beats them up by himself. He and Gleek fling their feces at the fallen prey. A winking Cena turns to Gleek and says, “Boy am I pooped out after that.” They embrace, the end. Where is Dr. Horrible when you need him? I’m sure he, Moist and Bad Horse can do something about it. (cowboy singers) Bad horse. Bad horse. Cowboy 1 (talking) Disclaimer: Bad horse has stepped down as the Evil League of Evil, evil head, either temporarily or permanently. Dr. Horrible has stepped in to be either a temporary or permanent evil head to fill his shoes for the time being. So for the time being, change the name from Bad Horse to Dr. Horrible. Or he’ll make you his mare . . .
And Capt. Hammer in the meantime is still on the couch sucking his thumb and whimpering to his counselor. Sad to say, the coup d’etat in Brazil might as well be called the Brasilia Screwjob.